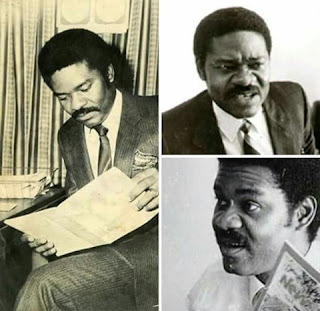 Yesterday, Thursday 19th October, marks the 31st remembrance anniversary of Sumonu Oladele 'Baines' Giwa (16 March 1947 - 19 October 1986); a legendary Nigerian journalist, died after he was killed through a parcel bomb. The journalist who died at 39 was known for exposing corrupt and illegal dealings of the government and this earned him recognition. The Newswatch editor had just written an article on second-tier foreign exchange market (SFEM), a Central Bank of Nigeria (CBN) policy introduced at the time. Under the SFEM policy, the determination of the naira exchange rate and allocation of foreign exchange were based on market forces. Ajibola Kunle Togun, the then deputy director of the SSS, later met with Giwa and said he did not find anything offensive in the story. But in a different turn of events, Ray Ekpu, a colleague of Giwa, said Togun accused the journalist of planning to publish the “other side” of the story on the circumstances that led to the removal of Ebitu Ukiwe as chief of staff to Ibrahim Babangida, former military head of state. Giwa was also accused of plotting with the Nigeria Labour Congress (NLC), the Academic Staff Union of Universities (ASUU) and other groups to carry out a “socialist revolution”. Around the same time, Giwa was quizzed by Halilu Akilu of the directorate of military intelligence (DMI) over an allegation that he had been heard speaking to some people about arms importation. He appeared at the SSS headquarters on the matter on October 16, 1986 — two days to his assassination. On October 18, Akilu called Giwa’s home and asked his wife Funmi for directions as he wanted to stop by on his way to Kano. On the day of the assassination, the DMI official reportedly told Giwa over the telephone that the matter had been resolved after the journalist inquired about his frequent calls. Not long after the call, a package was delivered to Giwa which severely wounded him. He was with Kayode Soyinka, London bureau chief of Newswatch, who narrowly escaped the blast after he excused himself to visit the restroom. Giwa was taken to the hospital but later died from the wounds he sustained from the blast. He would have been 70 this year. Although, Mohammed Buba Marwa, a former military governor of Lagos state, has been accused of being the courier of the bomb, no one has been convicted for Giwa’s murder. Meanwhile on June 8, 2009, Professor Taiyemiwo Ogunade gave a bombshell interview in which he made startling revelations about th ose who killed Dele Giwa in 1986. While speaking with SaharaReporters, he spoke specifically about the role of former military administrator of Lagos State Buba Marwa in the assassination of the journalist. Dr. Ogunade disclosed that soldiers loyal to the slain General Mamman Vatsa identified Marwa as the person who delivered the parcel bomb that killed Giwa, the Newswatch magazine founder. He said the revelation came from a confidential discussion he had with one of the military boys who came to the City University of New York (CUNY) to press the college to train Nigerian military officials in “Peace and Conflict Resolution”. He said that Vatsa gave a four-hour long testimony to the military tribunal that tried and later sentenced him to death for a phantom coup plot against former military dictator, Ibrahim Badamosi Babangida. I believe that Buba Marwa did it. Some Mamman Vatsa boys told the full story in New York during a visit to my college to lobby our college to accept to train Nigerian military officers. Ambassador Olusola was on that entourage. [My informant] told me Dele Giwa was killed because he was in possession of a tape containing Vatsa’s testimony before the military tribunal. For four hours, Vatsa requested to tell the full story about how the Babangida regime was operating and his knowledge of the workings of IBB’s mind. He pointed out that after Halilu Akilu and Col. A.K Togun of the military intelligence prepared the parcel it was handed over to Buba Marwa to deliver to Dele Giwa. Marwa is a well–known “IBB boy”. But I was the one who gave Dele Giwa the tape.